911-220 B Value Series - 3.5" O.D. Miss Mallory is a modular play structure with 2 climbers , a straight slide , a triple rail slide and a pyramid roof for shade. It also has as a transfer station, a chain net climber and tic tac toe panel. 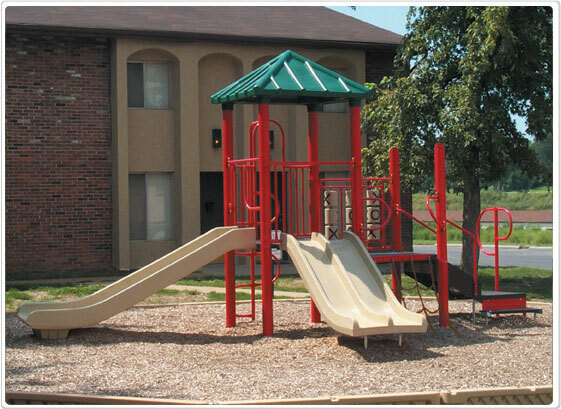 This playground equipment is appropriate for ages 2-12, and is also available in 5" OD post playstructure. This item requires a freight quote to your desired destination. Shipping costs are figured directly from the weight of the order and the location of the “ship to” address. For an accurate shipping quote, please contact our sales representative or request for a quotation if you want to purchase this product.